NES Bionic Commando (USA) in 13:45.26 by Phil. Bionic Commando is a platform game with a hero who can't jump, but can quickly latch onto objects with his bionic arm. This TAS is praised for its inhumanly fast grappling and swinging. This is Phil's first contribution to Bionic Commando. It is an improvement of 12.36 seconds over the previous run and proves he is a cat burglar. 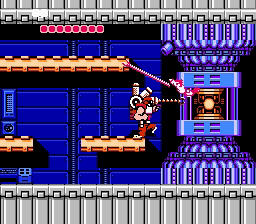 For more swinging goodness, check out Bionic Commando for the Game Boy.